Rachel Suzanne Smith is an artist, metalsmith, and educator. She is currently making work, teaching at Kent State University, and coordinating the Museum To Go program at the Canton Museum of Art. She received her undergraduate degree at Miami University in Art Education with minors in 3D Media Studies (jewelry/metals) and Spanish. She received her MFA in Crafts (Jewelry Metals Enameling) at Kent State University. Rachel Suzanne Smith’s work reflects themes of identity and ornament, focusing specifically on the desire to connect with the outdoors and nature. 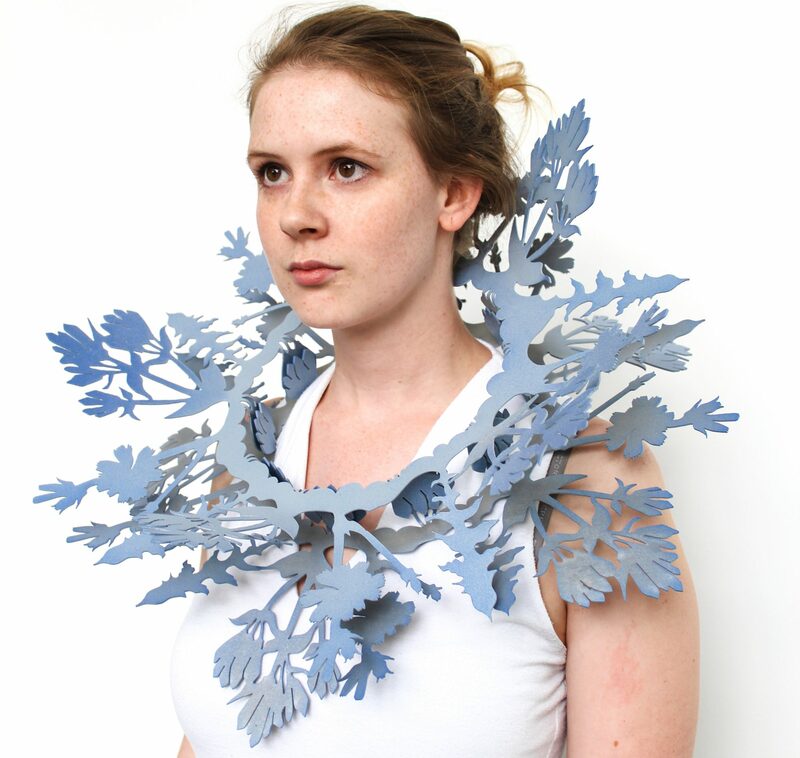 The facilitation of that need occurs through the use of adornment, allowing the wearer to surround themselves in arrangements and clusters of plants, created via the artist’s photographs and sketches. Rachel Suzanne Smith’s work has been exhibited nationally and internationally. She was a finalist in the 2017 Friedrich Becker Prize and exhibited the work in the Finalist Exhibitions in the Stadtmuseum Düsseldorf and the Deutsches Goldschmiedehaus Hanau. She was a 2016 Niche Award winner in the category of Sculpture to Wear. Also active in the Ohio art scene, Rachel has received the Fresh Air award while showing at the Akron Summit Art Space, and the award for Excellence in Metals at the Ohio Craft Museum during their annual “Best of” exhibition. Laser Cut Steel, Powder Coat. Rachel Suzanne Smith. 2017.